Question: I am a merchandising management student, I want to know how to calculate the cost of a garment using following details. 1. Fabric consumption: 0.8 yards per garment. 3. Fabric price: $2.7per yard. 4. Total charges for insurance & fright $ 0.3 (per yard). Fabric is being ordered from Hong Kong. 5. Finance charges for fabric purchasing is 15%. 6. Trim cost: $ 1.5 per garment (excluding thread cost). 7. 5000 meter of thread cones being used for sewing, 210 meters of threads needed for a garment and the price of a thread cone is $6. 8. Garment SMV is 40. To calculate the cost of the garment, I will first create a table in excel sheet. Then I will calculate material cost and labor cost. 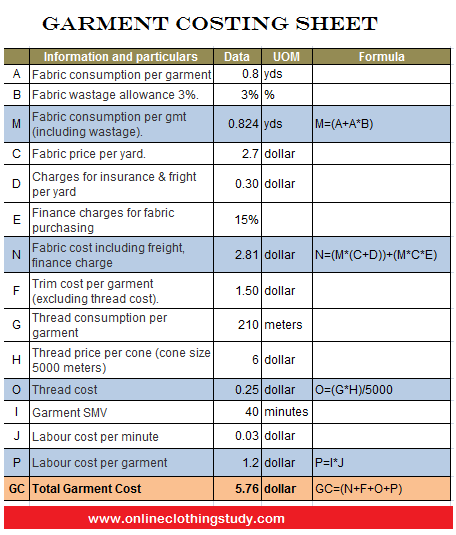 Finally sum up all cost together to calculate total cost of the garment. In the following I have shown you step by step process for calculating cost of the garment using information provided on the above. Step 1: Arrange information in the excel table, provided on the above problem. See the following table, where I have arranged all required information to find final garment cost. I have given code number to each information A, B, ...J.
I added extra rows where I need to calculate something to calculate sub costs and necessary information. Like M, N, O and P.
Step 3: Calculate fabric cost per garment (N): Factory has incurred cost in insurance and freight and finance charge. I have calculated fabric related cost together. Step 4: Trim cost: Total cost of the trims has been given. Step 5: Calculate thread cost (O): From the thread rate (unit 5000 meters) and thread consumption, thread cost per garment is calculated. Step 6: Calculate labor cost per garment (P): Labor cost per garment is calculated using garment SMV (standard time) and labor cost per minute. I have calculated all sub costs required to find total garment cost.